Artash delivering training on Arduino and Robotics. 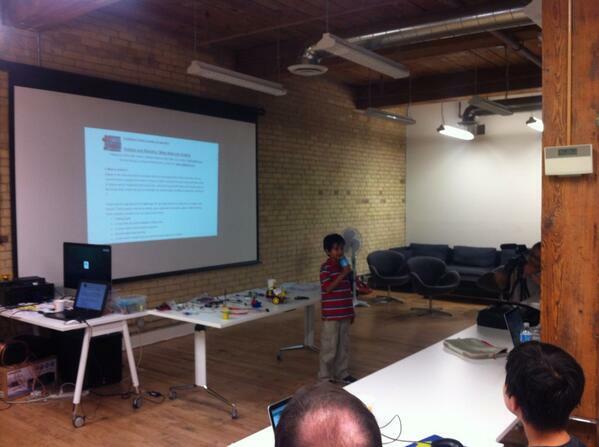 Artash, 2nd Grader and Co-founder of Hot Pop Robot http://www.HotPopRobot.com delivered a 3 hour hands-on training on Arduino and Robotics at CoderDojo Toronto on 22nd June 2014. Almost 20 kids and their parents attended the training programme. A training module was prepared for the participants to help them learn more about Arduino microcontroller, its various pins, the software and the most commonly used commands. Download the training module from here. 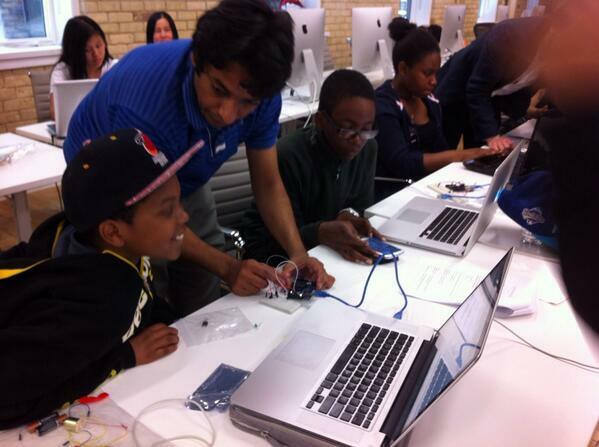 Kids learning how to control motors using Arduino. 1. Output and Digital Write functions: Blinking 1 light emitting diode (LED) – followed by creating flashing lights with 2 LEDs. 2. Input and Digital Read functions: Controlling an LED using a switch. 3. Controlling motors and Transistors: Run a motor using Arduino and mosfets and controlling them using a switch. The training was well received and requests came up to organise more such trainings in schools, including more advanced training for those who attended this training programme.